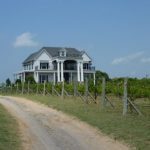 Mitas Hill Vineyard is located in McKinney and is owned by Harold and Sue Mitas. Their daughter Lisa Kocsis is the winemaker and their other daughter Michelle Beythan handles the tasting room making it a family affair. 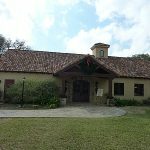 The actual tasting room and event center is currently being built so tastings are done in another building. As such, appointments are needed for tastings which occur at 1:00 pm and 3:00 pm on weekends. 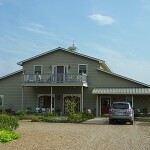 I arrived to Mitas Hill Vineyard with friends and made the early appointment time we had reserved. We were not sure what to expect but interestingly, we loaded up with others in a covered tram for a tour of the property and vineyard. That was a nice surprise especially since some other wineries charge a fairly hefty fee for the same type of tour. Harold Mitas jumped aboard the tractor hauling the tram and started our tour. At the first stop, we all got a bottle of water. This came in helpful because it turned out to be a hot day. Harold explained to us about growing grapes and demonstrated how vines are grafted on rootstock. He showed us the first year vines which were planted in May and then in August how they were training them at that point. 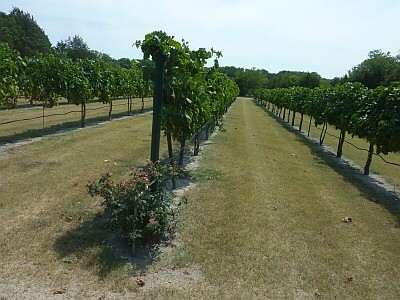 They first planted vines in 2006. 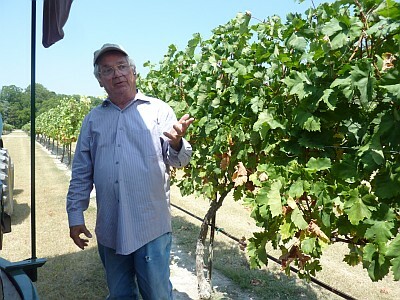 I could go on with a lot more details about the vineyard such as drip irrigation, glassy-winged sharpshooters, fertilizing, Buffalograss, and more but you would enjoy the tour much more learning first hand from Harold Mitas. Harold said they started making wine in 2010 and all grapes used are estate grapes. They don’t “source any grapes in and don’t source any wine out.” About two-thirds of the vineyard is Tempranillo which was suggested by Inwood Estates Vineyards owner/winemaker Dan Gatlin. They are also growing Black Spanish, Cabernet Sauvignon, Zinfandel, Syrah, and Black Venus. Black Venus is a grape which I had not heard of before. 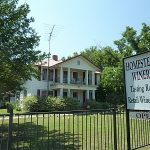 It has a flavor of Labrusca and Muscat, was created by the University of Arkansas as table grapes, and the wine tastes just like the grape. It is also the first to bud out in the spring. Harold said they are not aware of any others growing it in Texas. There was one vineyard in the Red River Valley but they pulled out all the Black Venus because of frost. Mitas Hill has not had a problem with frost yet for the Black Venus. We rode throughout the vineyards and also to the hill where the event center is being built. At the time of our visit, the foundation was just getting boarded and I have seen photos since then that the concrete has been poured. By looking at the event center drawings, it is going to be a first class establishment when done. 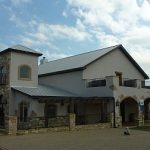 This is good because Mitas Hill Vineyard plans on the event center doing very well at drawing in weddings. 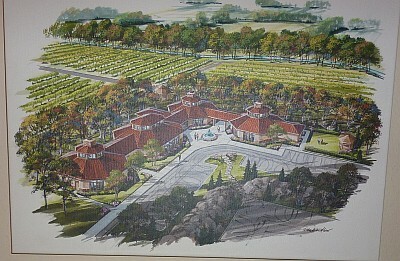 The eventual building will house the winery, tasting room, ballroom, and overnight lodge. The Exclusive Club Membership members will own a row of grapes and have a special room where the wine will be made and stored for them. The state-of-the-art building will have extraordinary views of the vineyard. The last stop was the temporary winery with wine barrels and fermenting grapes which Harold needed to punch down. He said he and his daughter Lisa prefer to use their arm to punch down the cap instead of using a tool because they can feel the differences in temperature. 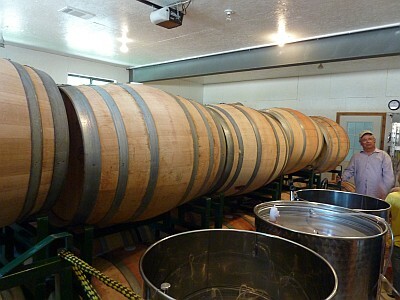 Mitas Hill uses both French and American barrels. One interesting thing we learned is neither Harold nor his wife drinks wine. It was now time to do some tasting! We all sat down in a U-shaped set of tables and Michelle Beythan was at the front ready to lead our group’s tasting. The wines all use corks and the tastings are poured from the bottle. Did I mention the tour and tasting is complimentary? Michelle explained her sister-in-law Sherrie Mitas is a sommelier so she chose the pairings. That’s right, we received food paired along with the wines! The tastings started with a 2010 Tempranillo paired with manchego cheese. Next was a 2010 Cabernet Sauvignon paired with stuffed mushrooms. The next wine was a 2010 Tempranillo/Cabernet Sauvignon blend called Bojnice which has a label based on a castle in Slovakia. Their ancestors were immigrants from Bojnice in central Slovakia. The Bojnice Castle, built in the 12th century on a hill overlooking the town, is home to the International Festival of Ghosts and Spirits. Every year the legend of the castle is passed on, as well as the myths and magic surrounding the castle and those who lived there. 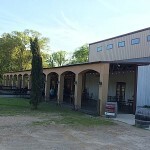 Mitas Hill Vineyard plans on holding a Texas festival of ghosts and spirits in the fall of 2014 based on the event held in Bojnice. Further wines were a 2011 Syrah, 2011 Zinfandel, and Black Gypsy (Black Venus grape) which was sweet with a cantaloupe pairing. The last wine was Squeeze Penny which is a Tempranillo/Black Spanish blend paired with the most wonderful chocolate cupcakes. 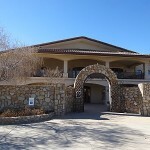 Mitas Hill Vineyard has a wine club and you will enjoy the estate wines. It will be interesting to revisit Mitas Hill Vineyard when the building is complete. 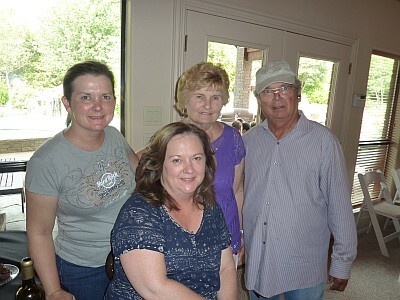 Until that time, make a trip to McKinney now and enjoy the wines and hospitality of Mitas Hill Vineyard. 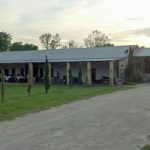 Thank you for the nice blog; I feel you captured the “flavor” of Mitas Hill Vineyard. For more on tours contact [email protected] and join us on Face Book. Thanks MJ. Can’t wait to come back next year! Tours and tasting and yes some pairing on Saturdays and Sundays at 1 and 3. Contact [email protected] for more information,and this is free at least for now.